Fashion after fifty - Be Glossy In and Out! "There’s no reason why you shouldn’t wear what you want at any age, but as you get older it becomes more important to dress for your shape and skin tone. There are no rules per se, although it’s probably wise to throw away cheap fabrics and anything shimmery. 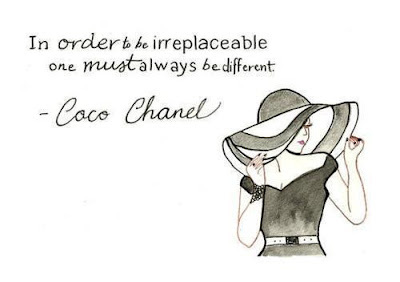 Coco Chanel is a great touchstone for beauty and fashion chic at any age. Her simple French style suits all age groups: simple, relaxed tailoring – no ‘power dressing’ – revere neck shirts and blouses, nautical details and soft pastels to warm the colour palette. If you would like to embody some classic Parisian style, these are the kinds of tones and shapes you should be looking to wear. Search around independent and high street stores for similar items and get the ultra-fashionable look without the high couture price tag. If you feel that your wardrobe needs an injection of energy, find a good shopping destination and make a day of it. Stay focused and don’t be afraid to ask for help. If the shop assistants look as if they should still be in school, opt for a personal shopping service. In retail centers these are often free of charge and you’ll save yourself from buying the wrong thing. Alternatively, take a friend who has no qualms about being honest; remember that other people will often see things we miss. A shopping centre like Bluewater in Kent is great for these kinds of shopping excursions, as everything is under one roof. It also has a lovely ‘boutique’ section with individual shops, which makes a nice break from fashion chains. It pays to spend time finding the right clothes, so don’t rush yourself. It is also important not to fall into the trap of thinking that because you’ve hit fifty, you need to dress a certain way. Feel free to evolve the style that you already have, but remember to dress to flatter your curves and to make yourself feel special. To make sure your shopping trip is made all the more rewarding, it would be wise to invest in some beneficial payment methods. Cashback cards can be helpful, as they offer you highly competitive rates of cashback with no limit on how much you can earn year after year. The American Express Platinum Cashback Card earns you 1.25% cashback on virtually everything you buy. Representative 18.5% APR variable." Thanks for the comment!!! Of course we can follow each other!! We follow you now!!! Great ! You're so IN !! gran blog!! Chanel es lo mas!!! Thanks so much for the comment love! I would love for us to follow each other! I just followed you - follow back?? Hi dear!!! Great blog & post! Thank you for your visit and your comment! Hi dear,thank you for your lovely comment!! Of course I follow you back!